Seventy years on from the original correspondence, the British Council has offered its apologies to George Orwell for declining to publish an essay which they had commissioned from him on British cookery. By way of amends the Council has published the original essay, along with the rejection letter from the Publications Department. An adapted version of the essay was later published in the Evening Standard as ‘In Defence of English Cooking’. The British Council rejected Orwell’s essay? What was new? Animal Farm was rejected on the right by T. S. Elliot (who said it needed more ‘public spirited pigs’) and by Victor Gollancz on the left because it was rude about Stalin. The British Council were also censoring Orwell politically – he made British food sound so ghastly. At least the British Council payed him 30 guineas even if they did not publish it! It seems that the organisation in those days was somewhat po-faced and risk-averse, and was anxious to avoid producing an essay about food (even one which mentions the disastrous effects of wartime rationing) in the aftermath of the hungry winter of 1945. 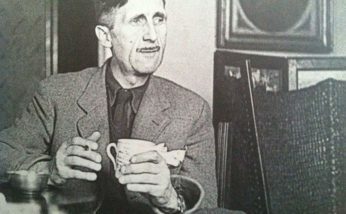 Both Orwell’s original unpublished essay, which includes recipes for such classic dishes as plum cake, treacle tart and welsh rarebit are included among The Orwell Foundation’s online resources, published with kind permission of Penguin Books and the Orwell Estate.